The Blue Angel hosta makes a striking addition to any landscape. It draws attention not only because of its silvery blue leaves but also because of its size. 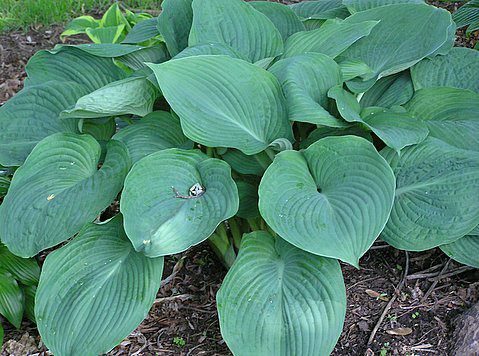 At maturity, this hosta stands between 24 and 30 inches tall and 42 and 48 inches wide. Adding to the visual effect are the Blue Angel’s white blooms. Not only does the color offer a nice contrast with the foliage, but the structure stands out as well. These blooms stand on three- to four-foot tall stems and will appear from mid to late summer. Like many other varieties, you’ll get visits from butterflies and hummingbirds all through the summer. Although the Blue Angel looks different from other varieties of hosta, it’s just as easy to care for. Put it in full shade or half shade/half sun and keep it watered. Your plant will flourish and will even multiply as the years go by.